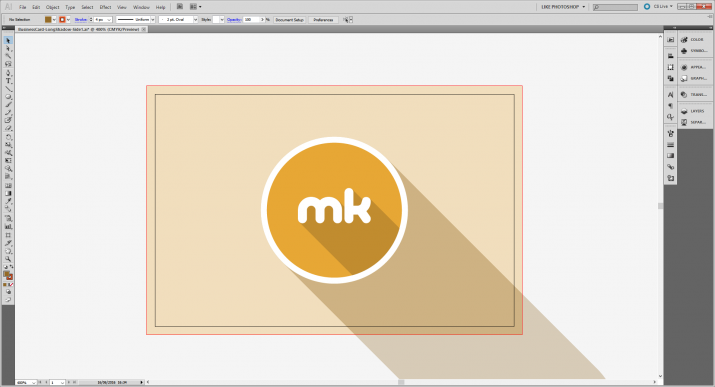 Remember our tutorial about Flat Flyer Design? We promised to go into more ‘depth’ in an upcoming tutorial. Well, here it is. 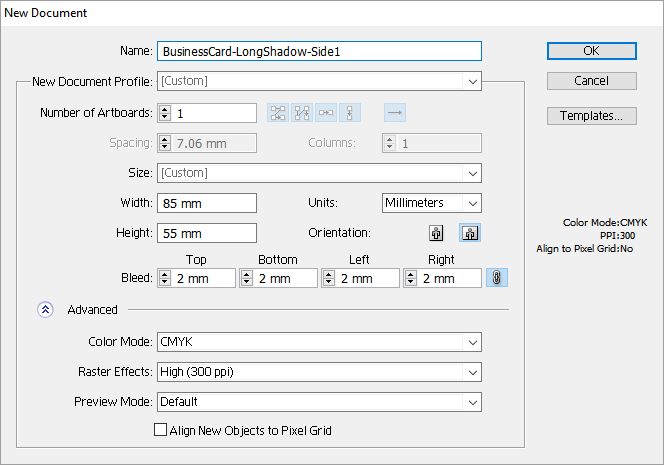 We will now create a Material Design Print using Adobe Illustrator – in this case, a two-sided business card whose various graphic elements ‘cast’ long shadows, thus giving an existing Flat Design a more three-dimensional appearance. We have also included the completed Ai and eps file at the end of this article. So what is Material Design? Back in 2014, Google invented a variation of Microsoft’s Flat Design and named it Material Design. Similarly, it is based on simplicity and minimalism like that of Flat Design. So whats the difference? In simple terms Microsoft’s Flat Design is ‘flat’ whilst Google’s Material Design uses shadows thus creating 3 dimensionality to its design elements. Considering these points the look of our business card is very minimal and modern thus in keeping with the current design trends. 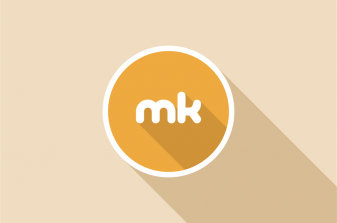 Material Design on your print media will add a touch of class to all your print projects. 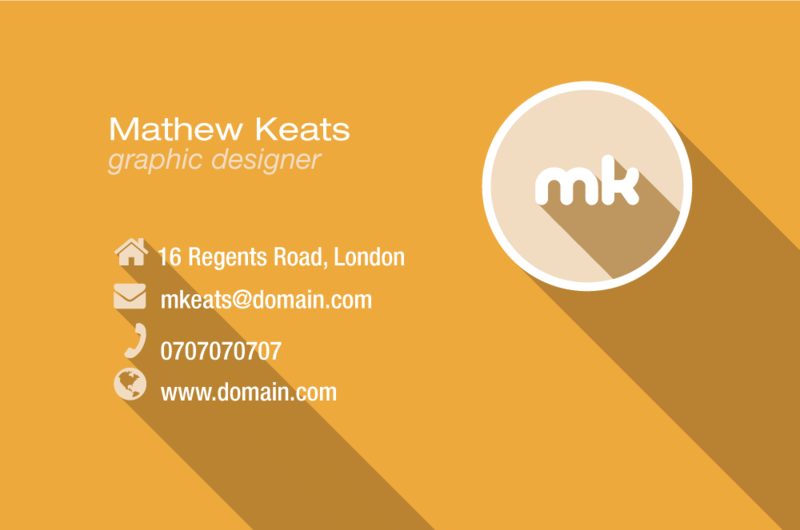 We are going to design a business card with dimensions 85 mm (width) x 55 mm (height). If you like, you can download a template with the correct dimensions and bleed from SAXOPRINT. Select the rectangle tool. Click onto the artboard and set values 89 mm width and 59 mm height. The extra width and height takes into account the bleed. With the rectangle still selected – centre the rectangle horizontally and vertically to the artboard (Horizontal align center and Vertical align center). Lock this layer. Select the ellipse tool. Click onto the artboard and set values 32 mm width and 32 mm height. With the circle still selected – centre the rectangle horizontally and vertically to the artboard (Horizontal align center and Vertical align center). Lock this layer. Bring in some graphical/textual element to serve as your logo. We have chosen the random initials ‘mk’ in a trendy font and made them a white fill colour. Make them quite large – obviously to fit nicely inside the background disc of the logo. With the logo still selected – centre the rectangle horizontally and vertically to the artboard (Horizontal align center and Vertical align center). IMPORTANT: We need to copy the logo as will become apparent later on. Lock and hide the copied elements layer. You might have to experiment with these figures to get a smooth shadow. IMPORTANT: The shadow needs to extend beyond the circular disc and be smooth as seen in the image below. Change the shadows opacity, say to 40%. Remember the layer that we copied the logo. Now it comes into use. Unlock that layer and Reveal it. Lets trim the excess logo shadow that is extending beyond the disc. Select the Ellipse tool, click onto the artboard and set values 32 mm width and 32 mm height. No fill colour and no stroke. Center it to the artboard. With it selected also shift select the shadow. SELECTION TIP: You can select individual objects easily from the layers panel. Use Alt and click on thumbnail on that layer. This will select that object. No need to try to locate it on the artboard. 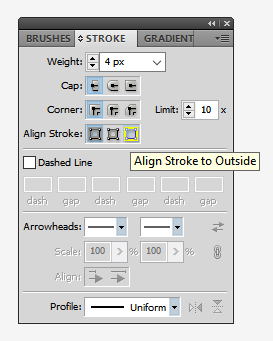 To select multiple objects use Shift-Alt and click on the second thumbnail of the appropriate layer. With the disc and shadow both selected the right click and select Make Clipping Mask. This now cuts the shadow excess beyond the disc. Lock this layer. You will probably have to move the layer with the graphic logo up one layer up to reveal it properly. Unlock the layer that contains the disc. Select the circle. Stroke it with a white colour and thickness of 4px. You will probably see some shadow still visible as the stroke is centred by default. With the circle still selected open the Stroke panel window (Window > stroke) and select align stroke to outside ie the last selection. 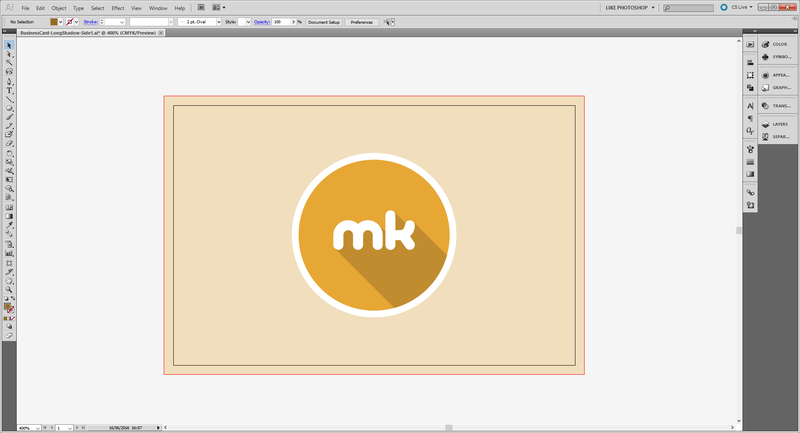 Select the circle again and Object > Path > Outline Stroke. Now the stroke has become part of the circle. Why we did this will become evident in the next step. Lets create a similar shadow; now for the disc. IMPORTANT: We need to copy the disc, as we did for the logo. IMPORTANT: The shadow needs to extend beyond the art board and bleed and be smooth as seen in the image below. Select this layer and make it burnt orange in color. Opacity 30%. Note: We don’t really need to trim the excess shadow this time. Move the main graphic element layer up and move the inside shadow element up. This completes the front of the business card. You can either open a new document to do this or use a new layer within the same document. The settings as in Step 1. Keep the front side file open. We are going to copy some of its contents for the back of the card. Copy the logo with its back disc and shadows from the front of the card and paste it into the new document. With the objects still selected group them together. 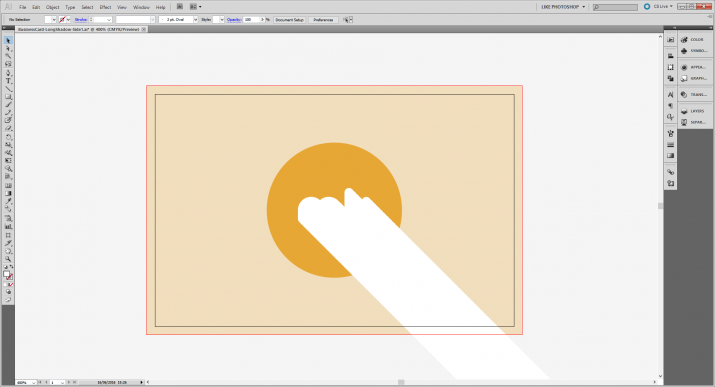 Resize the grouped objects to make it smaller and move them to the right of the card. The top of the grouped objects 7 mm down from the top of the card and the right of the grouped objects 75 mm from the left edge. IMPORTANT: We need to make sure the shadow of the back disc extrudes beyond the bleed of the card. Select the layer thats contains the back disc. Changes its fill colour to the same colour as the background of the card on side 1. Were also going to alter the opacities of the shadows. Select the logo shadow layer. Change its opacity to 65% to make it a little darker. The opacity information is displayed and altered in the Appearance panel. No select the back disc shadow. Change its opacity to 70%. Lets add a person’s name with a fill colour same as the disc colour i.e. the Pale Yellow colour. And a title i.e. the profession. We have made it a white fill colour and a thinner font. Add some icons and contact details. We have added a shadow to the icons similarly as before. 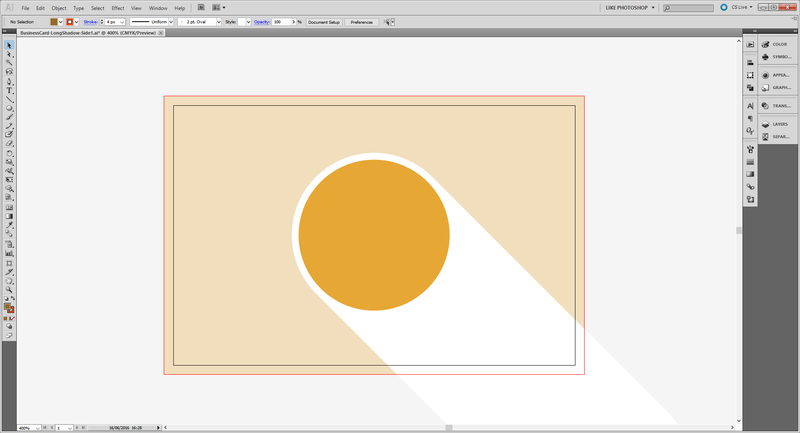 The only thing you will have to be careful of is if you apply an opacity to individual shadows. Each streak created by each icon will show through. SELECTION TIP: Its better to group all the shadows of the icons together then apply the opacity to the group. So here we have it. 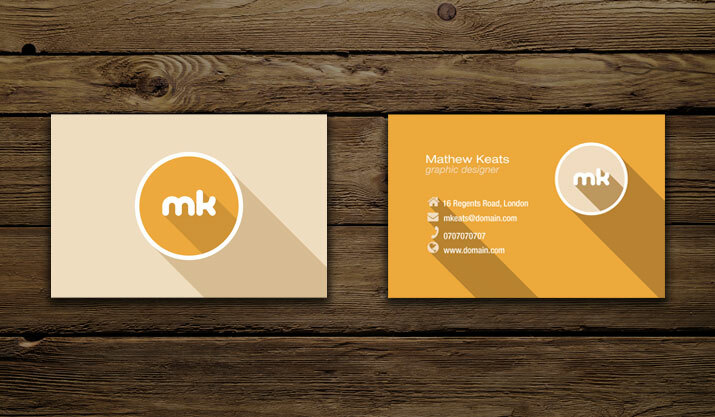 A two-sided Material Design print business card. Please feel free to download the completed Ai and eps file of this project. I have read this blog. An amazing one. Get leaflet services from us.